Selecting a heat exchanger, and in general a thermal machine, the right selection of construction metals is fundamental, in order for metals to be suitable for the kind of application and effective working conditions of the machine. 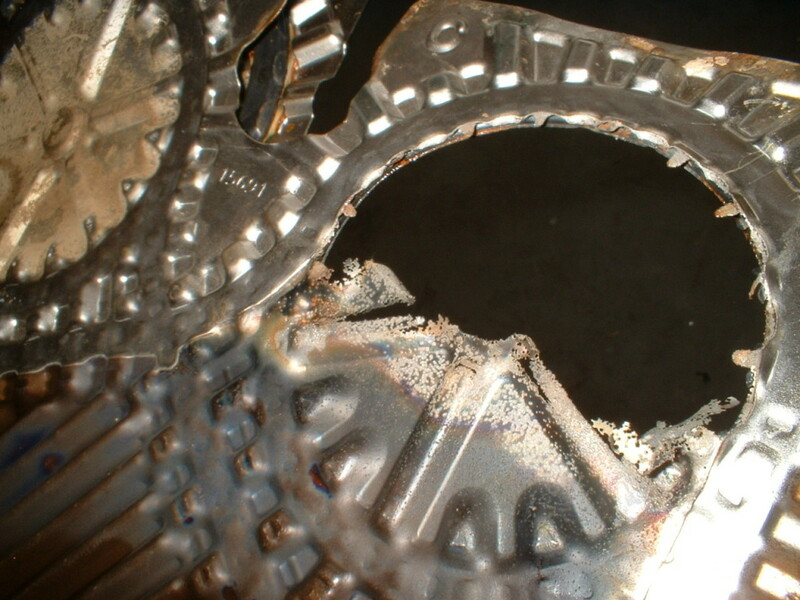 Corrosion is in particular a major topic, to be carefully considered since the engineering design step, for an equipment or a customer’s plant. Metals are indeed exposed to several external agents, being subject to natural deterioration. Entity and type of factors that can contribute in several and different ways to the corrosion of a metal must be clearly evaluated, in order not only to choose the right material, but also to calculate the right thickness for the components. For example, once stated the corrosion level expected for a certain kind of metal, under the action of certain stress factors during one year time span, is possible to calculate the suitable thickness for a metal tank: the thickness must ensure the full and reliable performance levels of the equipment, augmented by the value of the thickness calculated upon the corrosion level and the working life time expected. Corrosion events are often involved talking about buried metal structures, such as pipes and tanks. Here, different factors are causing corrosion of materials: soil humidity, and geological characteristics of the soil itself, for example its compactness, if it’s gravelly, sandy or clay, influencing the amount of oxygen circulating, or the capacity to drain water. The presence of sulfate-reducing bacteria also is defining the corrosion level of a certain metal, as well as high temperatures that can increase the corrosion process. Also, the presence of electrical currents on soils is important, flowing through the buried metal structures due to their lower electrical resistivity, compared to the soil, grabbed in cathodic areas and released on anodic areas, a phenomenon that increases the electrical potential of the metal structure, boosting the corrosion process. In case of metals selection for a heat exchanger, or a thermal machine, the type of corrosion to consider is the galvanic corrosion, i. e. the corrosion caused by the direct contact between dissimilar metals. For example, galvanic corrosion occurs when screws and fasteners used in an equipment are made of a different material than the one they are connecting. Combining metals having different potentials, in the presence of a third element called electrolyte, a flow of electrons is generated coming from the less noble metal, with lower potential (anode), toward the more noble one, with higher potential (cathode). The amount of electrons leaving the metal, and how fast the process is, depends on the kind of electrolyte. But the effect is to deteriorate the metal from which they move. An example: let’s think about a self-drilling steel screw in a copper sheet, with moist as electrolyte. Positive particles of the steel migrate to the atmosphere, where they join to oxygen and hydrogen particles becoming iron ions. Electrons, negative particles, migrate through the steel to the copper and the atmosphere, combining with oxygen and water, becoming hydroxyl ions, that combine with iron ions producing iron oxide, rust. Rust is the typical corrosion’s output, simply caused by the incorrect combination of two different metals. For this reason, knowing the potential of metals to combine is essential. Above is a simple galvanic chart featuring some of the most common metals, in order by potential. The arrow shows the current flow direction, meaning that between two combined metals, the one subject to corrosion will be the one in a higher place in the galvanic chart, i. e. the one closer to the anode (+). 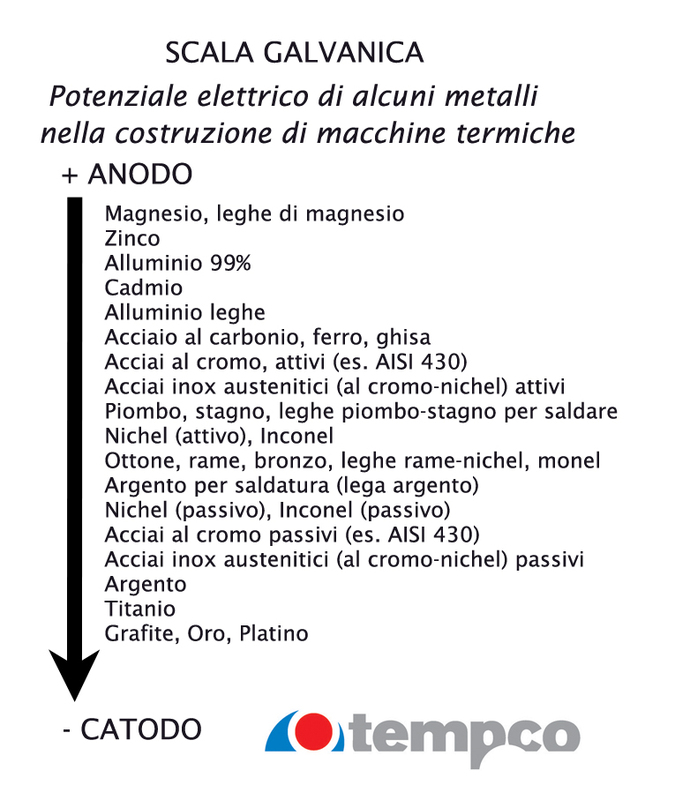 For the most suitable selection of the right constructing metals for your own thermal machines, and the proper evaluation of all the factors defining the corrosion level your equipments and plants will be subjected to, contact our Tempco technical office.